Taipei, Aug. 9 (CNA) President Tsai9 Ing-wen (蔡英文) reiterated on Wednesday Taiwan’s determination to defend peace and security in the Asia-Pacific region, and pledged that the country will continue to help the region cope with changes and challenges. 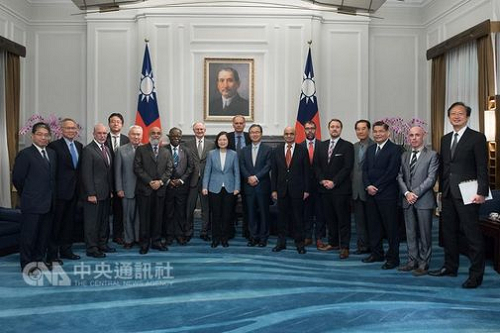 Tsai made the remarks in a meeting at the Presidential Office with foreign scholars and researchers who were invited to attend an Asia-Pacific Security Dialogue forum that took place in Taipei the previous day, according to a Presidential Office statement on the closed-door meeting. Tsai told her guests that defending security and peace is the duty of every country in the world, including Taiwan. Therefore, "in the international community, we will continue to play a role that is to actively assist our region to cope with all sorts of changes and challenges." "No single country can achieve that goal on its own," Tsai went on. "We must work together" to make the Asia-Pacific region safer and more prosperous than before. The group of Tsai’s guests included Alain Destexhe, a co-chair of the Belgium-Taiwan Friendship Group in the Belgian parliament; Peter Drysdale, an honorary professor in economics at Australian National University; and M. Matheswaran, a former deputy chief of India’s Integrated Defence Staff. Also present were Yoji Koda, a retired vice admiral of the Japan Maritime Self-Defense Force; Evans Revere, a senior researcher at the U.S.-based Brookings Institution; and Robert Wang, a senior researcher at the Center for Strategic and International Studies, an American think tank, according to the Presidential Office.